Couch #11 belongs to Louis and Kene. Louis’ father passed away in 2002. He was living in Bakersfield with Louis’ youngest sister. The sister’s neighbor was moving into an assisted living place and was selling all of his stuff. The neighbor’s daughter liked Louis’ family and sold him the couch for $25. 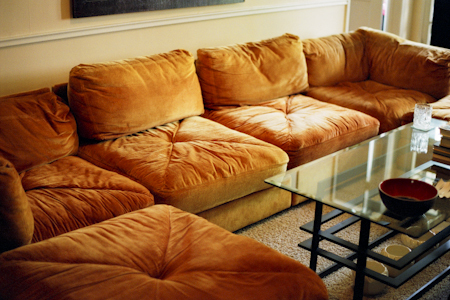 It is a vintage 1970’s 6 piece sectional. Louis and Kene live in a duplex in Miracle Mile. I believe that the building dates back to the 1920’s. Louis works at a social service agency doing administrative work and creates art work that photograph based. It can be either straight photograph, or he may alter the print turning it into a photogram or adding paint, thereby creating “no negative” photography art work. Kene is a retired curator. He used to research and buy art for galleries. They are a couple. Kene likes to go thrift store shopping and Louis likes to watch Law and Order, but not any of the other shows like CSI. Kene’s hobby is working with art and taking care of his pictures, prints, and books, but it’s really more of a lifestyle. Louis likes to buy vinyl albums and he still listens to them. Kene has a brain tumor and is a cancer survivor. He has had three surgeries. They can’t kill him. Louis remembers where he was before he was born. He was with God and when his body stops working he will return there as will we all. Louis and I met through myspace and then on Facebook. We met in person at a show we both had work in in April at urban:sanctuary gallery. Louis believes that we are two artists who are not afraid to reach out to other artists. When we are creating, we enter a wonderful state of mind. He’s right. Louis’ favorite song is “The Word” by the Beatles. Kene likes “When the Gates Swing Open” by Clara Ward. Kene likes Indian food, which is what I believe they had on one of their first dates. Louis enjoys eating meals without animals in them. Kene says that “All About Eve” is the best movie ever. Louis like “Broadway Danny Rose”. Kene thinks that once I distill the project down it will be interesting and beautiful. He also wants his 15 minutes of fame. Louis thinks that I’ve taken the next step in social networking by spending time with people outside of the internet. They have visitors in their place all the time. People who don’t want to leave. Both Kene and I heard a knock at the door that night but no one was there.